A very promising sign from our new friends at the Pi Bar. Thin crust – check. Slices – check! Welcome to La Lengua, my circular-food-making friends..
TO OUR FRIENDS AND NEIGHBORS OF VALENCIA ST.
After years of economic and personal trials, Suriya Thai Restaurant closd its doors for the last time on March 4th of this year. They will be missed by many. The owner of 1432 decided, perhaps for a fresh start, to paint over the well known Elephant Mural that graced the doors for the past 17 years. 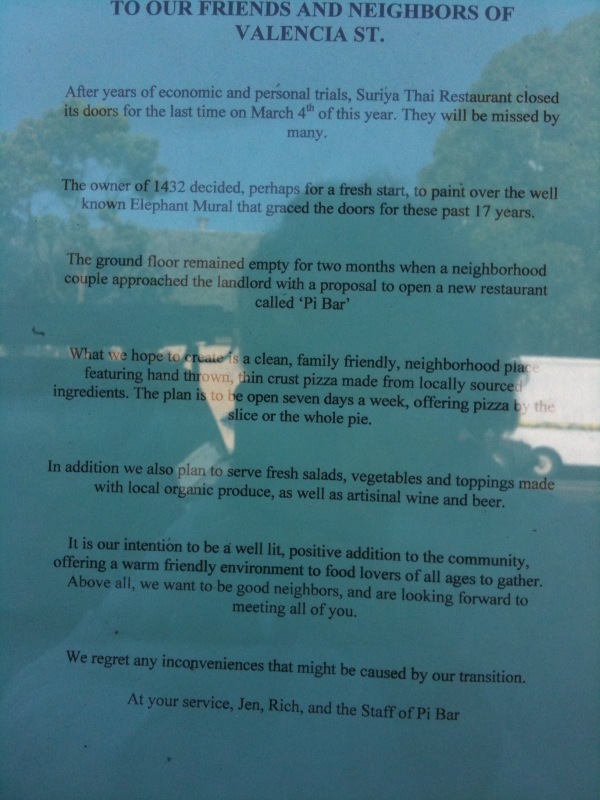 The ground floor remained empty for two months when a neighborhood couple approached the landlord with a proposal to open a new restaurant called “Pi Bar”. What we hope to create is a clean, family friendly, neighborhood place featuring hand thrown, thin crust pizza made from locally sourced ingredients. The plan is to be open seven days a week, offering pizza by the slice or the whole pie. In addition we also plan to serve fresh salads, vegetables and toppings made with local organic produce, as well as arisitian wine and beer. It is our intention to be a well lit, positive addition to the community, offering a warm friendly environment to food lovers of all ages to gather. Above all, we want to be good neighbors, and are looking forward to meeting all of you. We regret any inconvenience that might be caused by our transition. At your service, Jen, Rich and the Staff of Pi Bar. Can we order in radians?